Rice cookers come in all sizes and features. Some are built for household use and there are also other models designed for commercial use such as in restaurants, catering business, and canteen concessionaires among others. When you intend to use a rice cooker for commercial use, it follows that it must be big enough to accommodate a large number of people. But more than the size, the commercial rice cooker must also be dependable because it is for use in business. Here are 5 of the most trusted brands in commercial rice cookers in the market today. Aroma is the brand that has become a household name mainly because the company caters to small kitchen appliances market. The Aroma commercial 60-cup rice cooker however is not for ordinary households as it is large enough to use in a food business venture. Below are some of the features of this rice cooker. One-touch function – With a touch of a lever, it can manage to produce 60 cups of cooked rice. Auto-warm – A soon as rice is cooked, the unit will automatically switch to auto-warm function to keep rice warm and ready to eat any time. This feature helps keep rice fluffy and hot as long as the power cord is plugged. Built- in locks for the lid – To help keep rice warm, the unit comes with built-in locks for the lid. When the lid is locked when the rice cooker is not in use, it can help in ensuring that the cooked rice is safe and free from dirt and other elements. 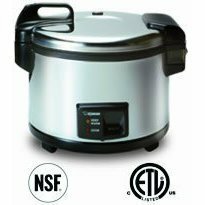 Stainless steel body – With stainless steel body, this rice cooker is built to last many years of use making it ideal for business use. Cool touch housing – With a rice cooker this big, you might imagine it can become too hot to handle. But this unit has very good insulation that keeps the heat inside so it remains cool on the outside. When it comes to quality and dependability, Zojirushi rice cookers has already built a solid image in the mind of many customers. It is then no wonder that even their commercial rice cooker is also trusted by many owners of a food business. This brand is for the discriminating buyers who are willing to shell out additional money in exchange for quality, durability and dependability. Simple operation – Just one touch and this rice cooker will do the rest. As soon as the rice is ready, it will automatically switch to keep your rice warm. Stainless housing – The smooth housing is made from durable stainless steel therefore you are sure that it can last for years. Insulated housing – The Stainless housing keeps the heat inside so there is no danger of scalding from the outside. Water measure line – The inner pot has a measuring line that can help in determining the right amount of water to be added to the uncooked rice. It is a toss-up between the above two commercial rice cookers. You can go for the Aroma 60 cup (cooked) rice cooker or choose Zojirushi 20 cup (uncooked) rice cooker. The choice as always will depend on your actual needs. 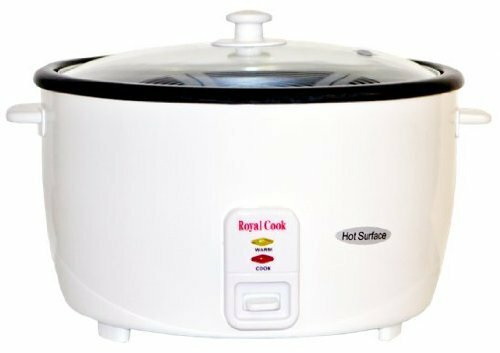 Your Royal Cook RC-77251 Persian Rice Cooker with Glass Lid, 25-Cup, White comes with see-through glass lid and measuring cup and non-stick coated pan. It features Crispy/Browning Rice Function and Keep Warm function and thermal fuse to protect the unit from burnout. Such a unit is perfect for those who are trying to make Persian crispy basmati rice (“tahdig”) without the hassle. It works with US electric system (120V, 920W) and all you need to do is to just add equal parts water to equal parts rice, add salt and oil for taste and click the button. Once the rice is fully cooked the cooker switches to a keep warm function to keep your rice warm until ready to serve. The pan inside is Teflon coated and is removable for cleaning. The cord is not removable. It does not have a separate timer for tahdig, but it automatically makes the tahdig. For white rice, it is also great, fast and perfect for when you have people coming over and do not have the time to make the rice in a traditional “Ab-kesh” way. Definitely, you can make any kind of rice in this rice maker; this is a must have for Iranian cooking as it makes great tahdig (crispy rice) for Persian rice, is easy to use and big enough for a party. It is amazing as it works as described and is great for large gatherings. You get much more of the tahdig because you get a nice crust on the sides. 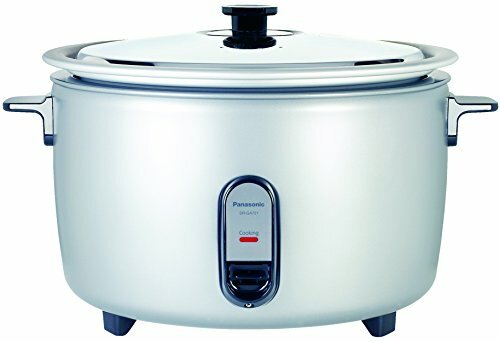 If you look for a Panasonic rice cooker, you should consider Panasonic SR-GA721L 40-cup Commercial Rice Cooker, “NSF” Approved, Stainless Steel Lid. For a little less money, folks should also consider Panasonic’s line of commercial units. Although they may not be as good or keep the rice as moist as the above Zojirushi or Tiger models since they do not sport a sealed lid design, for the money they still remain a good buy for making very large quantities of rice. The overall cup capacity is around 40 raw cups(remember 1 cup of rice equals 3 cups cooked rice). Operation is easy, just measure, plug, and press down on a lever. The Panasonic models also come equipped with keep warm modes that kick in automatically. 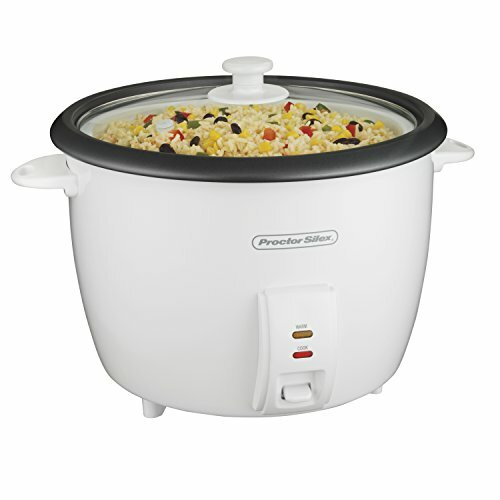 You can cook various kinds of rice such as white rice, brown rice, wild rice, pink rice, rice mixes and Cajun Jambalaya as this is a really good rice cooker for cooking rice to feed many people. If you want your rice like Persians cooked, do not buy this or take your rice out before it steams while it is wet. Also, from what we gathered, some Panasonic commercial rice cooker units have a 220 volt power cord so folks may need to purchase a converter for use in 110v outlets, (please confirm with an electrician before use!). This rice cooker weighs 6.79 pounds and features an aluminum pot inside. It measures 12.4 by 10.6 by 14.7 inches and has a 1 year labor and parts warranty. The Proctor Silex cooker has the standard automatic warm setting. The inner pot has a hearty coating of Teflon, this is a well thought out rice cooker which is well-built. It’s also great that it has a water catcher located under the hinge to keep water from dripping onto the counter. 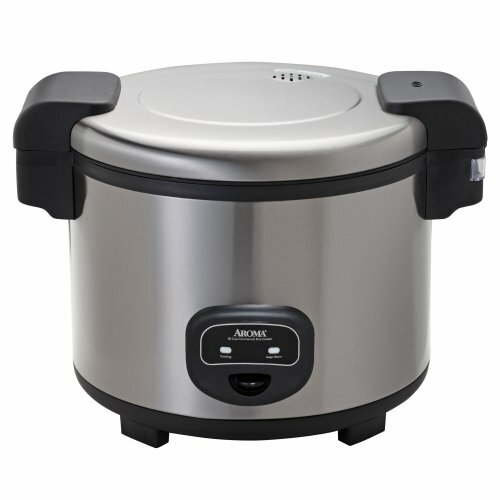 This is great professional rice cooker for any kitchen! This rice warmer is built with a stainless steel exterior for unmatched durability, and the interior non-stick pot makes it easy to clean after a long day. Conveniently, this rice cooker also comes with a measuring cup and paddle. Does the rice cooker cook 6 cups of uncooked rice or 20? Check this icon below to find out. We found out the weight of each rice cooker, just look below to find the details. Look for this icon below and you will find the measurements of each and ever rice cooker. Is your rice cooker made in China, Japan or Taiwan? Check this icon for the info! Certainly, after consulting all these products, you can get an idea about extra large rice cookers that can give you some aid in a commercial kitchen and not only. Once you have chosen the item, be sure you are reading carefully all the instructions before starting to cook; so, everything will be under control and your rice will be delicious.